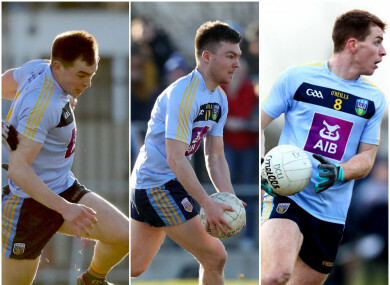 TEAMMATES ON SATURDAY, some of UCD’s Sigerson Cup heroes may be forced into action against one another in the Allianz Football League today. Conor McCarthy’s Monaghan go up against Kerry at 2.30pm, with midfield duo Jack Barry and Barry O’Sullivan named to start for the Kingdom in the re-fixed Division 1 game. In the Monaghan team issued on Friday night, Malachy O’Rourke selected Conor McCarthy to start at corner-forward, but UCD boss John Divilly is hopeful all three players will be given the day off. “I haven’t got a clue, I haven’t asked them (if they’ll play),” Divilly said after UCD’s 1-13 to 2-9 win. The Kerry-Monaghan game was originally fixed for last Sunday in Inniskeen but was postponed on the morning of the game due to an unplayable pitch. McCarthy dispatched 1-6 as was the key figure in the UCD attack as they sealed a second Sigerson Cup title in three years, and a 34th overall. “It’s nice I suppose when you put it like that,” Divilly said. “All I’m hearing is that it should have been three-in-a-row. But if you don’t kick the ball over the bar you’re not going to win a game. Mary’s did that last year. Maybe that drove the guys on quietly this year. “I’d need to look at the programme but I think we had only six or seven starters from last year. We had a fairly brand new team even though they’ve been around a while. It’ll be the same again next year. It comes in cycles. “All you can is to provide the best coaching that you can to these guys, let them enjoy it and, I mean, this pitch today was outstanding. It allowed for such a game of football, there was a summer hop on the ball today. Email “After lifting the Sigerson Cup yesterday, UCD's Monaghan and Kerry stars set to clash today”. Feedback on “After lifting the Sigerson Cup yesterday, UCD's Monaghan and Kerry stars set to clash today”.